A classic film noir, Gilda smolders in the Buenos Aires heat as a small time gambler, his ex-flame and an illegal casino baron get embroiled in a personal duel against the backdrop of a dangerous cartel emerging from the post-war shadows. American Johnny Farrell (Glenn Ford) washes up in Buenos Aires penniless but still adept at cheating his way to winning at any gambling opportunity. He is spotted by Ballin Mundson (George Macready), the smooth but ruthless operator of a lavish underworld casino, where the elite come to play. Ballin hires Johnny as his business manager and second in command, and the two men develop a strong friendship. But the trust between them starts to evaporate when Ballin returns from a trip suddenly married to the beautiful Gilda (Rita Hayworth). Although they both initially deny it, it becomes obvious that Johnny and Gilda are former lovers who broke up on bad terms. Gilda, perhaps a mistress of the oldest profession, is a wild spirit who cannot be contained by Ballin, and she starts running around with any available man, primarily to make Johnny jealous. Ballin becomes preoccupied when his involvement with an illegal, Nazi-linked tungsten cartel starts to catch up with him. He asks Johnny to keep an eye on Gilda and make sure that she stays safe, but the flame of passion between Johnny and Gilda is about to be reignited. Directed by Charles Vidor, Gilda is a careening adventure into the sordid world of lovers' revenge, packed into the tight quarters of shady gambling and global intrigue. It's a breathless exercise in smooth narcissism, every man for himself, one woman on a twisted vendetta, all in a foreign location where all the normal rules are suspended. Photographed by Rudolph Maté in smoky black and white, almost every scene is a masterpiece of shadows, angles and lighting that hides the sinners in the corners. Gilda is populated by slippery secondary characters who animate Ballin's casino, oozing hidden agendas from every pore and turning the gambling den into the favourite hangout for the crooks, the cops, and the crocked. Maurice Obregon (Joseph Calleia) doesn't drink and doesn't gamble, he is there as a government agent charged with keeping an eye on the place and untangling the tungsten cartel's secrets. The durable Uncle Pio (Steven Geray) looks after the bathrooms, and is a lot more astute than he looks. And then there is the twisted-looking old man who regularly walks in, bets on "2 black" at the roulette wheel, and walks away with a wad of cash, all part of the effort to keep the peace. And finally there are the two "Germans" who show up to try and reclaim control of the cartel away from Ballin, now that the world war is over and all. It's all reminiscent of Rick's Cafe Americain, of course, but the Gilda screenplay (by Jo Eisinger and Marion Parsonnet) is not concerned with great struggles between good and evil. At Ballin's casino it's all about personal greed, lust, jealousy and betrayal, a world full of selfish Ricks who are looking out for their personal gain and pleasure. 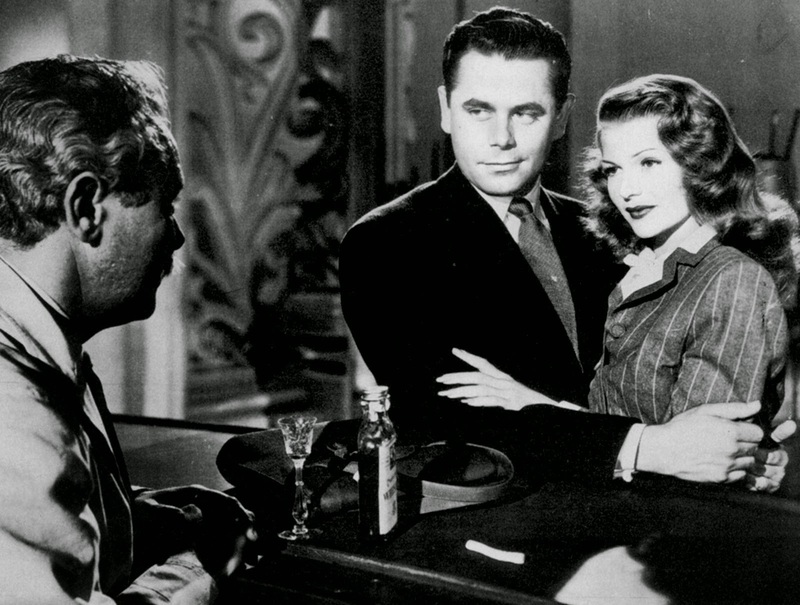 A luminous Rita Hayworth has never been in a better film, and she creates in Gilda a seductress, a lover and a victim all rolled into one amazing woman who can neither be resisted nor controlled. Liberated by Gilda's unrestrained sexuality deployed in a frontal assault to reclaim her one shot at true love, Hayworth gets to perform two sizzling dance numbers (with singing dubbed by Anita Ellis). Put The Blame On Mame is an inferred striptease meant to make the walls sweat, while Amado Mio is a more subdued but still sinewy number. Glenn Ford and George Macready are both excellent as the two men in her life, but Vidor ensures that whenever Hayworth is on the screen, nothing else matters. Gilda proves to be the catalyst for both Johnny and Ballin. Both men are enjoying financial riches until she walks into their lives, and by the time the drama has played out, it is clear that no life stays on the same trajectory once Gilda makes an appearance. An exceptional force of nature and an alluring partner for the man who tames her heart, Gilda is a game changer.